Development of design rules through understanding exciton dissociation and charge generation dynamics is an important pathway to improve the performance of hybrid inorganic–organic solar cells. In this work, we study the photophysical behavior and dynamics of charge generation in organic/inorganic hybrid based on poly(3-hexylthiophene) (P3HT) and zinc oxide (ZnO) nanostructures by steady-state and time-resolved fluorescence spectroscopy. Both films of P3HT:ZnO nanoparticle (NPs) blend as the active layer and pristine P3HT as the active layer on ZnO nanorod (NRs) array buffer layer can provide efficient interfaces for exciton dissociation and charge transfer. P3HT can infiltrate into inter-rod space of ZnO NRs and cover them to enhance the 0-0 band against the 0-1 one in the steady-state photoluminescence spectrum. 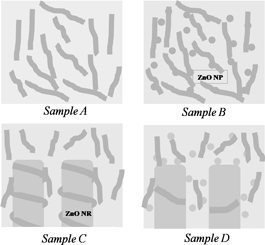 However, the configuration of P3HT: ZnO NPs blend as the active layer on ZnO NRs buffer layer poorly further improves the exciton dissociation, due to the decreased organic-inorganic interface area.